This is how you make salami cups! 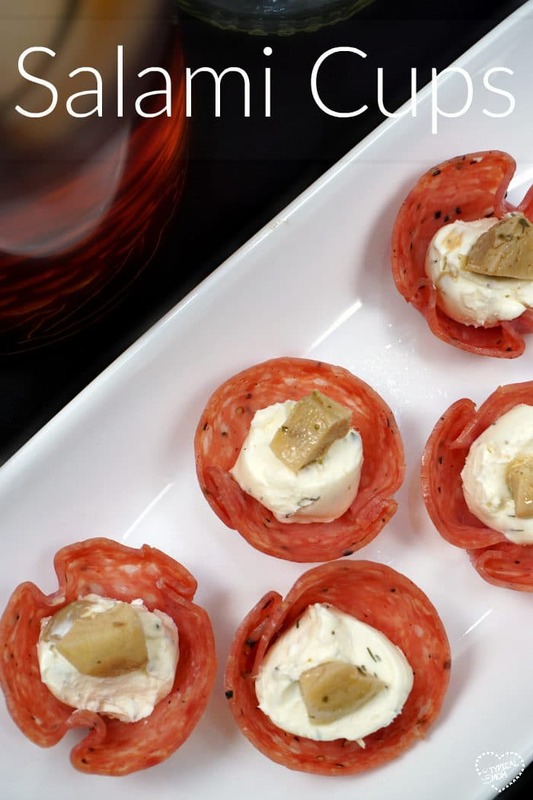 These are the best bite size cream cheese and artichoke appetizer with salami used as a little cup. You’ve got to bake these and serve them at your next Super Bowl party or just because friends are coming over. You will need cream cheese, a jar of marinated artichoke hearts, and dill, too which isn’t far away (or you may have them already at home). As far as making the cups you will need a mini muffin pan and tin foil. If you don’t have either of those you can find them at Walmart too. All you do is push one piece of salame into each mini muffin cup and crinkle up a piece of aluminum foil to keep it down so it doesn’t pop back up when it’s in the oven. Just put in at 200 degrees for about 8 minutes or until the edges get just a tad crispy and when you pull the salami cup out of the pan it keeps its form. You don’t want to cook them too long or else they will become dry so just test them after the 8 minutes by pulling one out, take out the foil and see if it stays looking like a salami cup, if not add a minute and check again. 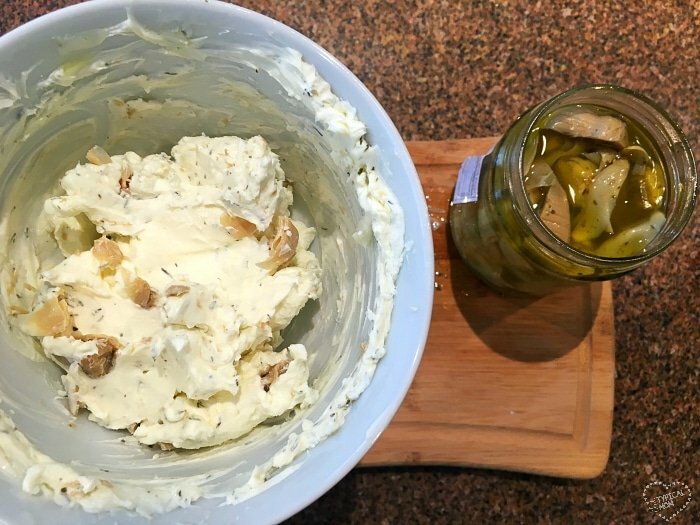 Now just mix the cream cheese, dill and artichoke filling together and fill your salami cups. If you prefer another type of filling go ahead and let your imagination go. 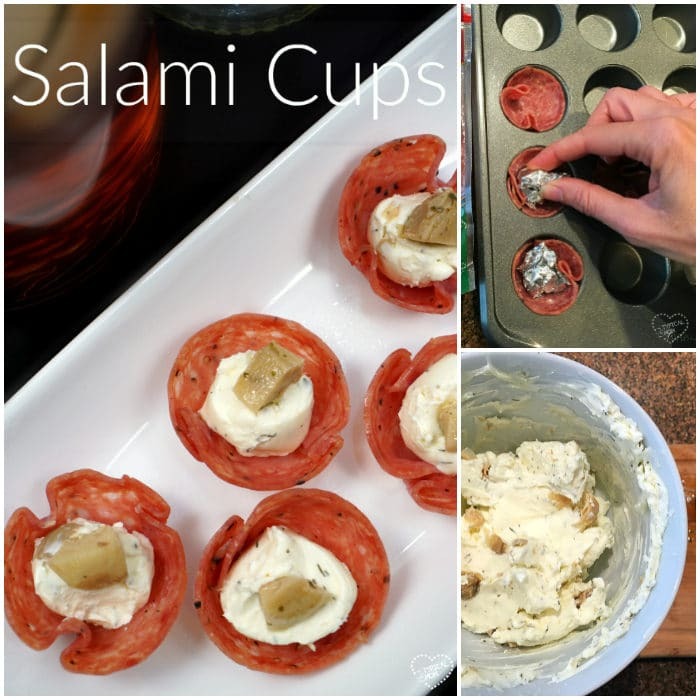 This is just to show you how to make salami cups and the rest is really up to you. These are two of my favorite treats so I combined them to make a creamy flavorful filling. I mixed a few marinated artichokes in with my room temp cream cheese and then after filling my cups I added a whole piece to the top. Seriously. So. Delicious. 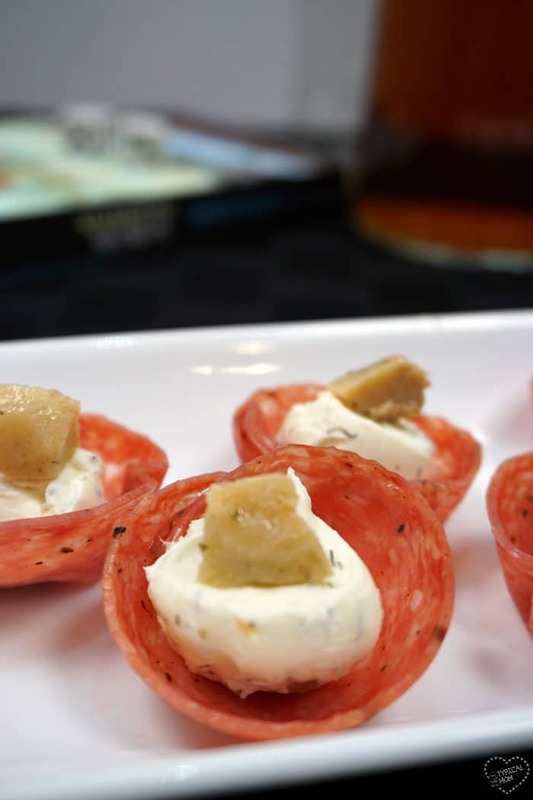 This is how you make salami cups! These are the best bite size cream cheese and artichoke appetizer with salami used as a little cup. You've got to bake these and serve them at your next Super Bowl party or just because friends are coming over. 1 pkg cream cheese room temp. 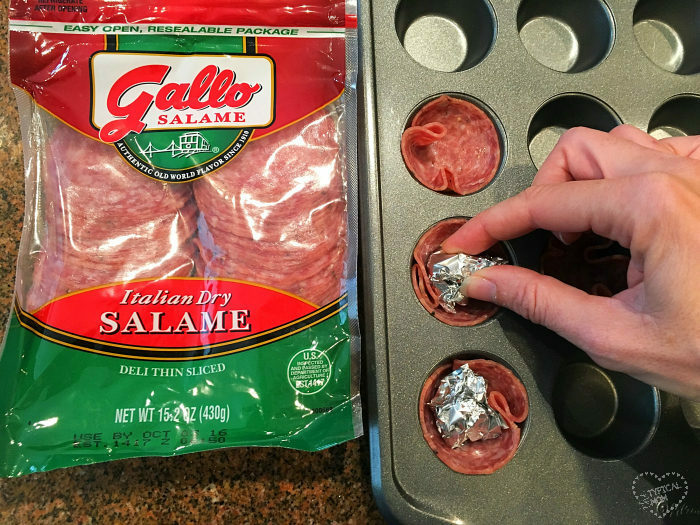 Push salame slices into mini muffin pan with a ball of aluminum foil inside to keep salame in the cup. Bake in oven at 200 degrees for about 8 minutes or until salame keeps it's form. Mix cream cheese, 3-4 diced artichoke hearts and 1 tsp. dill together. Spoon into cooled salame cups and put 1 small piece of artichoke heart on the top. Serve! I let the cream cheese become room temperature so that it mixes a bit easier. Add your dill (more or less depending on taste) and then fold in your diced artichoke hearts. Cut up a few extra pieces to put on top when you’re done for added flavor and flare. 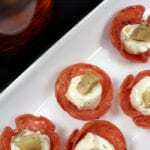 Perfect appetizer for game night, a party or book club!